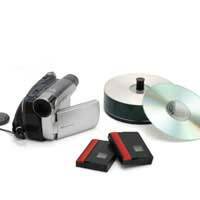 It’s likely that at some point you’ll want to get your home video files from your camcorder and onto a DVD from which you can make copies and give to friends. Alternatively, you might want to store them on your PC. To a novice, this might seem complicated but with a little bit of computer awareness, it’s quite a simple process. Some of the terms within this article might seem technical at first glance but if you print off a copy and read it alongside looking at your PC whilst you’re attempting to get your files onto the DVD or onto your PC, it should be fairly straightforward. Firstly, you should ensure that you buy some DVD-R disks which are suitable for video as opposed to those which are made for data storage. DVD-Rs (write once) tend to be better than DVD-RWs (rewritable) when working with your PC as some PCs struggle to recognise the DVD-RW format. Video takes up a lot of space which is why most digital camcorders will store your footage in MPEG-2 or MPEG-4 format which acts to compress the file size so that it will fit onto a standard DVD without any noticeable loss of picture or sound quality. Therefore, when you connect your camcorder to your PC, you should be able to locate the files on your camcorder by the MPEG file type as the PC will recognise when you have connected your camcorder to it (you’ll most likely have had to load a programme onto your PC when you bought your camcorder) and, therefore, will also recognise that you have files loaded on your camcorder which your PC will ask if you want to transfer them across and where you want to store them. You’ll probably already have a folder entitled ‘My Videos’ already located on your PC where they will be transferred to, or you’ll create a folder in the location of your choosing. If you then explore the contents of a movie on your PC’s hard drive, you’ll notice two folders that look something like VIDEO_TS and AUDIO_TS. The VIDEO_TS folder contains all the compressed video and sound files as well as all the information that’s needed to play both audio and video together in the correct order. The AUDIO_TS files are empty and redundant for DVD but are left there for compatibility reasons for when you had an audio file only. When you open the VIDEO_TS folder, you’ll see several files ending in .VOB as well as other files. It’s the VOB files that contain everything you’ll see and hear and, if appropriate, these will also include subtitles and any additional viewing angles. These will be numbered in sequence and, for feature length films, they’ll often be anything from 700kb up to around 1gb, or even more, in size. It’s these VOB files that are the key to getting your home video from your PC and onto your DVD. However, if you’re not going to be putting your home video onto a DVD, the other option is to store them on the PC. Although the memory of PCs has been vastly increased over the last few years and you can now get PCs with 60gb of memory and upwards, it’s important to remember that video files consumes a vast amount of space. Therefore, even some of the PCs with the largest memory space will soon fill up quickly if you start loading feature length films onto it. Not only will you soon find that your PCs memory fills up quickly, you’ll also find that the performance of your PC in terms of the speed of the processor soon becomes sluggish. So, if you intend storing videos on your computer, the best way of doing this is to buy an external hard drive. These can simply be plugged in to your PC via a USB port and they can store anything up to 320gb and even more. Therefore, this means that your films are now stored on this device instead of clogging up your computer’s hard drive. Alternatively, if you’re just going to watch a film once and then delete it, you can open up the MPEG-2 file and watch it via your PC’s media player, then delete it after you’ve finished watching it.